What's key in having a great photograph in 2017? It's not technical quality; today's iPhones have better specs than digital SLR's from even a few years ago. It's also not about a perfect hustle with your aperture, shutter speed and ISO. "P"-mode on cameras nowadays do an excellent job on auto-pilot. It's also not about getting a series of lucky, machine gun style shots. We're the most content spoiled generation and there's probably too much visual content. Less is - indeed - more. I'd argue that wildlife photography is about technical excellence and luck. Logistical excellence and research outnumber the odds in favor of the artist. Luck is when timing meets preparation. And when great content, access, perseverance and research morph into one you'll get some visceral imagery. This all crossed my mind when preparing for the big shot in Chobe, situated in northern Botswana. I wanted the image to emphasize the animals which take center stage in these characterizing wetlands. Yet again I didn't want yet another uninspiring, uncreative and unpersonal application for a "Big 5 checklist" image. This immediately brings a few challenges. For one, you can't work from a distance. With a 400mm you loose context, control and intimacy. "If your pictures aren't good enough, you aren't close enough", as quoted by Ansel Adams is undoubtedly true. Second, there's no interesting way to photograph big animals other than from the ground up. You want a low point of view to evoke their massiveness. So working from high up a Land Cruiser is out of the question. 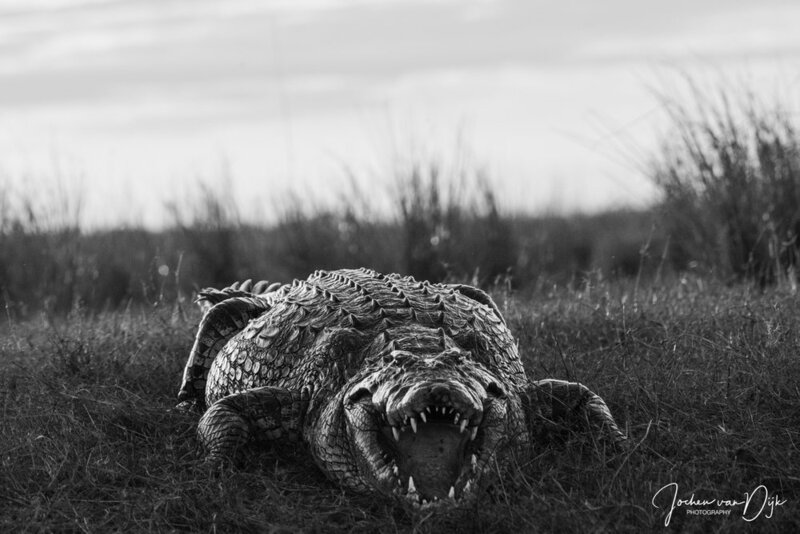 With this in mind I made my setup on the river beds, waiting for the perfect light, composition and hoping every crocodile was in line of sight. Eventually the big shot came... Although I wasn't lying flat down this is actually what makes this image work. The headlining tusker is pin sharp, but the appearance of the hippo and grasslands in one still changes the whole dynamic and brings a strong visual context to this image.